Want to know what your children or spouse are doing on your PC? Get a keylogger and be informed! Handy Keylogger 4.1 is a new version of award-winning keylogger which gives you full control over your PC, and is totally undetectable to other users. With Handy Keylogger it is possible to start stealth monitoring in several clicks after your free download is complete. Handy keylogger mainly features and does a very good job with four types of logs: key strokes log, clipboard log, screenshots and websites visited. Handy Keylogger top features: Keystroke Logger; Handy Keylogger will secretly record all keystrokes typed and is completely undetectable to any user but you! 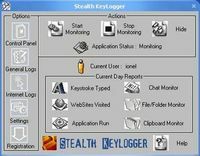 With this keylogger you will have the most detailed keyboard monitoring reports in Win 9x, NT and 2003 systems. Clipboard Monitoring If someone receives an illegal password or login name by e-mail, he usually copies it to the clipboard and pastes wherever it might be needed. Capture them also! Undetectable Keylogger mode. With Handy Keylogger there's no button or icon visible anywhere: in the Task Bar, process list, Task Manager list, uninstall list or system tray. Nobody can reveal its presence. Passwords tracker. Wherever users type passwords, you will be able to capture them and store into highly secure logs only you can review. Chats & Internet messengers sniffer. Handy Keylogger easily captures popular chat and instant messaging services and provides you with a clear record of all conversations that took place. Screenshots Maker. Imagine surveillance cameras pointed directly at your home PC filming all Internet and general PC activity. You don't need them if you have Handy Keylogger!